Does this sound like something you can afford to pass up? Like our current $30 plan, the 99¢ license will be good for life. Like sales in the App Store or Droid Market however, this license is only valid for a single computer. Sound fair enough? If you’ve been someday planning on upgrading to WinPatrol PLUS, January 29th is the day to remember. Just go to www.WinPatrol.com this Friday and you may be a part of history." Head over to Bits from Bill for the rest of the details on this one-day event. Even if you already have a license for WinPatrol Plus, it is a great opportunity to purchase one for a friend or family member. Note: The upgrade to 3.6 is available via the program updater for exsisting users. Note however, that this is a major upgrade and some of your addons may not be compatible. Download for localized versions is available at International versions: Get Firefox in your language. Microsoft released out-of-band Microsoft Security Bulletin MS10-002. It is strongly recommended that this update be installed as soon as possible. MS10-002 is identified as Critical for all supported releases of Internet Explorer, including Internet Explorer 5.01, Internet Explorer 6, Internet Explorer 6 Service Pack 1, Internet Explorer 7, and Internet Explorer 8. The only exception is Internet Explorer 6 for supported editions of Windows Server 2003, in which case the update is rated Moderate. MS10-002 is accelerated from the regularly scheduled February release update. "This is a standard cumulative update, accelerated from our regularly scheduled February release, for Internet Explorer with an aggregate severity rating of Critical. It addresses the vulnerability related to recent attacks against Google and small subset of corporations, as well as several other vulnerabilities. Once applied, customers are protected against the known attacks that have been widely publicized. We recommend that customers install the update as soon as it is available. For customers using automatic updates, this update will automatically be applied once it is released." Although Microsoft reports that they continue to see only limited attacks, with the only successful attacks they are aware of against Internet Explorer 6, it is, nonetheless, recommended that anyone who has yet to update to Internet Explorer 8 would benefit from the improved security protection available with IE8. Additional information is available in the Advance Notification for Out-of-Band Bulletin Release. "Based on our comprehensive monitoring of the threat landscape we continue to see very limited, and in some cases, targeted attacks. To date, the only successful attacks that we are aware of have been against Internet Explorer 6. We continue to recommend customers upgrade to Internet Explorer 8 to benefit from the improved security protection it offers. We also recommend customers consider deploying the workarounds and mitigations provided in Security Advisory 979352. Given the significant level of attention this issue has generated, confusion about what customers can do to protect themselves and the escalating threat environment Microsoft will release a security update out-of-band for this vulnerability." Additional information regarding the timing of the release will be provided tomorrow. Microsoft determined that Internet Explorer was one of the vectors used in targeted and sophisticated attacks against Google and possibly other corporate networks. According to Threat Level at Wired.com, Adobe was impacted and it appears that at least 34 companies were breached. Adobe Product Security Incident Response Team (PSIRT) announced an update to Adobe Reader and Acrobat affecting a critical vulnerability in Adobe Reader and Adobe Acrobat 9.2, including all earlier versions. As this vulnerability is being actively exploited in the wild, update is strongly advised. Microsoft released one security bulletin affecting all versions of Windows. MS10-001 addresses one vulnerability in the Embedded OpenType Font Engine and is Critical on Windows 2000. For all other versions of Windows, the vulnerability gets a Low rating. Microsoft designated the bulletin an aggregate rating of “2” on the Exploitability Index as it applies to Windows 2000 systems. All other systems are rated “3”. "The vulnerable code is present on newer operating systems but through the Security Development Lifecycle (SDL), there are several mitigations in place that help prevent the likelihood of exploitation. Our Security Research & Defense (SRD) team has a great write up on this in their blog. We do recommend that customers evaluate and deploy this update as soon as possible. Especially those on Windows 2000." This security update resolves a privately reported vulnerability in Microsoft Windows. The vulnerability could allow remote code execution if a user viewed content rendered in a specially crafted Embedded OpenType (EOT) font in client applications that can render EOT fonts, such as Microsoft Internet Explorer, Microsoft Office PowerPoint, or Microsoft Office Word. An attacker who successfully exploited this vulnerability could take complete control of an affected system. An attacker could then install programs, view, change, or delete data, or create new accounts with full user rights. Users whose accounts are configured to have fewer user rights on the system could be less impacted than users who operate with administrative user rights. On Tuesday, January 12, 2010, Microsoft is planning to release one new security bulletin addressing a single vulnerability in Windows. The vulnerability is critical on Windows 2000 and low for all other platforms. An updated version of the Microsoft Windows Malicious Software Removal Tool will also be available. 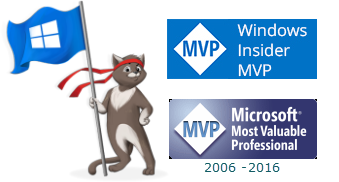 I am proud to announce that for the fifth year, once again I was awarded Microsoft MVP. Contributing to the specialness of the award is the knowledge that of the over 4,000 MVPs worldwide, only a bit over 100 are awarded in Consumer Security. Awarded in over ninety technology areas, MVPs reflect Microsoft's global customer base and the breadth of Microsoft's technologies. A significant proportion of new MVPs represent emerging markets in China, Russia, and Korea, as well as smaller markets including Ghana, Nepal, and Kazakhstan."